I rode a short but hilly ride today. The first major hill was a 16.5% grade and I made it with no problems. Coming back over the mountain, I made it to about a 9% grade until I had to stop. I seem to have problems when the grade gets any higher than 8%. Details from the ride are here. 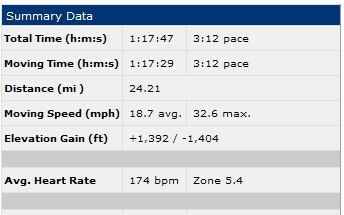 A little better average today over a longer distance, but of course it’s much easier riding with a group. If you are in the McCalla Area and like to ride your bike, join us Thursdays at 6 at the Winn Dixie on Morgan Road, Exit #6 off I-459. It’s a good ride with rides for all levels of experience, and different distances as well. My ride today. I decided to get up this morning at 5:45am and ride out to Montevallo to join a group that rode out to the Winery in Calera and back. 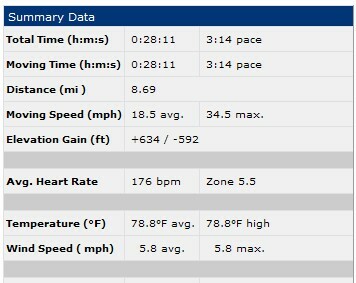 It was a nice ride, not to demanding and a really slow pace. 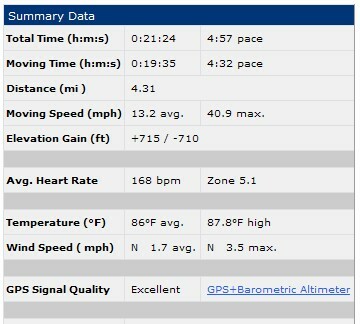 I rode 40 miles, with an elevation gain of 2,017 and about a 15 mph average for the ride. The weather was nice early on, but got hotter toward noon. A good 14 miles today, a little bit of it in the rain. Hopefully tomorrow I’ll have my cycle computer, we shall see. It will depend on what time the FedEx man delivers. Who is at home at 11:55am on a workday??? 15 Miles Today in the Rain at Oak Mountain State Park. I road a long 15 miles today in the rain at Oak Mountain State Park. Really the first time I can recall riding in the rain. It’s a down pour right now with no let up in sight. I’ve got a new cycling computer on the way so hopefully I can start a better training regiment and start seeing some results! 25 Miles today. I’m dead tired.